By Horst D. Dornbush Altbier is considered Germany's oldest and most famous beer style. This book explains how monks and nuns brewed it in Düsseldorf centuries ago, and how to brew one today. 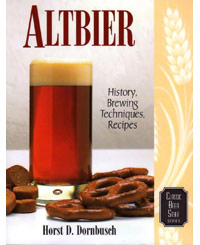 Altbier covers brewing processes, flavor profile, recipes and much more. The Classic Beer Style Series from Brewers Publications examines individual world-class beer styles, covering origins, history, sensory profiles, brewing techniques and commercial examples.